First, I must apologize to Brendan for delaying this review for so long (Note:he has no need to apologize because upon getting it, I promptly took 2 months to get it posted. Shame on me! ~ Brendan)! But I promise the wait was worth it, because I have THREE Killer Bee gis for review today. Find the best deals on Women’s BJJ gis over at Hypnotik! 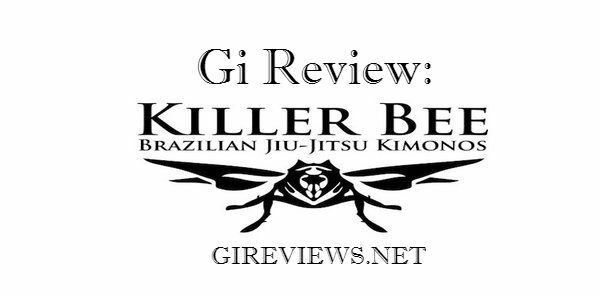 I am sponsored by Killer Bee Gi but I have kept this review very honest. Jesse never asked me to post a review, and this is my experience with the gis he has sent me. For all sizing and ordering information, go to www.killerbeegi.com. This is a very sharp looking gi, as it is black with gold embroidery. On the A1 Liguistica, the Killer Bee logo is embroidered on the shoulders and a small patch that says “Killer Bee” with the logo is sewn on the bottom left lapel. The top embroidery is consistent on all Killer Bee gis, at least those that I’ve received so far. There is a Killer Bee logo embroidered on the bottom left pant leg. There is reinforcement in the armpit, crotch, and knee, as well as triple stitching throughout all three Killer Bee gis I own. The “Ligustica” is Killer Bee’s pearl weave gi. It’s lighter than their “Sculleta” weave, which is a gold weave; I do not own any Sculleta gis, but I do know they are heavier than the others. I always wear a rashguard under my gi, so the gi has never felt rough on my skin. However, even if I touch the inside of the gi with my hand, it feels quite soft and smooth. The outer fabric is as rough as you’d expect from a pearl weave; not as rough as a HCK gi, but definitely not soft. The collar on the A1 Liguistica is reasonably thick. It’s not as thick as the Fushida I reviewed earlier for GiReviews, but it’s definitely on the thicker “beefier” side of collars. The collar is covered in the ripstop fabric with 6 rows of stitching that extend all the way down the lapel. I must say, I am not the biggest fan of ripstop pants. To me, they often feel flimsy and get “see through” as you become more sweaty. However, Killer Bee’s ripstop pants are thicker than most, as they use 10oz cotton for their ripstop pants, which is slightly thicker than others I’ve seen. I’ve felt little discomfort while wearing these pants. Additionally, the knee reinforcement on these pants starts just above the and ends at the very bottom of the pants. The cord on these pants is a flat, ripstop cord made of gi material. As a 5’5″, 123lb girl, the A1 is a little big on me. The top is baggy and the sleeves are roomy, but the pants surprisingly fit quite well. If you wash in warm water and dry this gi, expect some shrinkage. I have shrunk the gi as much as I can while keeping it competition legal. Ideally, I’d like the sleeves and shoulders to be a little more fitted for a female body. Jesse sent me the women’s Liguistica Mark 2 with ripstop pants as soon as it came out. I have to give Jesse a lot of credit for using my measurements and feedback in developing his women’s line of gis. While many women’s gis are flooded with pink and various designs, the Killer Bee gi is remarkably understated. There are purple “Killer Bee” logos on the arms, a purple “Killer Bee” patch sewn on the left lapel, and no embroidery on the patch. I prefer gis that are more toned down, so this was a perfect balance. The gi has a white pearl weave top and includes a pair of white, ripstop pants. This gi was noticeable more tailored than the A1 gi I had received previously. The wingspan of the gi is noticeably smaller, and even though I only washed it in cold water and hung it to dry, I noticed the sleeves were too short on me to be competition legal. Unfortunately, I can’t remember if the gi was originally not competition legal or if it shrunk in the wash. Despite this small problem, it’s nice to finally have a gi that doesn’t feel so baggy! So many other A1 size gis I’ve tried are baggy in the chest and shoulder area; sometimes I feel like I can fit an extra arm in the sleeve! Jesse also made sure the side slits in the gi were cut a little longer to accommodate for a woman’s hips. The gi top and pants are made of the same material as the men’s Ligustica, but for some reason the pants seem more “crinkly”. This doesn’t really make a difference to me in terms of the fit and comfort of the gi, but it is something I noticed. The drawstring on these pants are a traditional rope cord as opposed to the gi material, which I prefer, as I find it stays tied better. I have also found that because these ripstop pants are a little thicker, they don’t get “see through” like other ripstop pants. The collar of this gi is thinner than the A1 Ligustica Mark 2. It is by no means flimsy, but it is thinner. This did not bother me because the collar is still stiff and not easy to manipulate. This collar is also covered in ripstop fabric and reinforced with 6 lines of stitching. The gis seems to get better and better! When I told Jesse that the women’s gi he initially sent me was a little too small to be competition legal, he made the appropriate adjustments. This time, I ordered a Ligustica top, but ordered the heavy cotton pants. The entire gi weighs 3.7 pounds. I picked grey contrast stitching, logos, and drawstring for this custom gi, and chose the gi color to be blue. This combination is exceedingly sharp!! The gi pants on this gi are clearly much longer than the other two, but it isn’t long enough to be too baggy. Additionally, and this is personal preference, I was happy to finally get some cotton pants that weren’t ripstop. These pants are made out of 12oz cotton and feel very sturdy. Given the durability of the ripstop pants, I have no doubt these pants will hold up to the wear and tear of training. The top is very similar to the original women’s Ligustica in terms of feel; rougher on the outside and soft on the inside. The fit is just right; it’s not as baggy as the men’s A1 but not as tight as the original women’s Ligustica. The skirt of this gi is also just slightly shorter than the original women’s Ligustica, which I liked. The collar has the same 6 rows of stitching, and feels marginally thicker than the original women’s Ligustica, but not as thick as the original A1 Ligustica. I was really humbled that Jesse picked me up as a sponsored athlete, and even more impressed that these gis are so sturdy and comfortable. I have yet to see any tears or loose threads on any of these gis. There are so many new gi companies on the market, and I feel that they’ve forgotten that these gis should be and are meant to be built to hold up to the wear and tear of training Brazilian Jiu-Jitsu as opposed to having the coolest design (while some have managed both!). Jesse runs a solid company, has always answered my emails within 24 hours, and put a lot of time in to making sure these gis are durable. I also appreciate that he has expanded in to women’s BJJ by creating his line of women’s gis and always taking my feedback. Killer Bee Gi will start doing custom orders again at the end of January, so stay tuned to the website! I love the fit of my Killer bee (F1 top, F0 bottom) I just think its too stiff, it gets very hot to roll in, I’d like to try the lighter material and cotton pants! Amazing womens fit though, cut slim, but not short like some of the other female gis I’ve tried.